Don't miss this collection of quotes to live by from DreamWorks Animation's newest boss, The Boss Baby. DreamWorks Animation's The Boss Baby, based on the Simon & Schuster book by Marla Frazee, is now an Oscar-nominated motion picture! 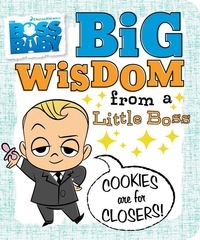 Share the best of The Boss Baby's hilarious corporate one-liners in this illustrated gift book, perfect for new parents, anyone who works in an office, and fans of the film. The Boss Baby (c) 2017 DreamWorks Animation LLC. All Rights Reserved.